Raith manager Barry Smith is closing in on his first signings, with a former Rovers striker believed to be among his top targets. The Press understands that Smith has held advanced talks with out of contract Alloa frontman Greig Spence, who could be on his way back to Stark’s Park for a second time. Rovers are believed to have competition for the 24-year-old’s signature, who netted 16 times for the Wasps in League One last season, but the club are hopeful that a deal can be completed over the next 48 hours. 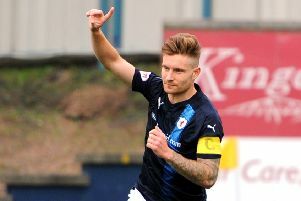 Spence initially signed for Raith under Grant Murray in 2012 following his release from Celtic and was part of the side that defeated Rangers in the Ramsdens Cup final in 2014. He scored 27 times in two seasons at the Kirkcaldy club, before moving to Alloa, who were then managed by Smith, then Cowdenbeath for a season, before returning to Alloa last term. In total he has scored 93 senior goals in 259 appearances in all competitions. Smith is also in discussion with a number of other targets following confirmation that that club has released several members of the first team squad who suffered relegation from the Championship last season. Leaving the club are Conor Brennan, Chris Johnston, Jean-Yves M’Voto (who has signed for Dunfermline), Kevin McHattie, Scott Roberts, Rudi Skacel, Mark Stewart and David Syme. In the case of Stewart, who signed a contract extension in January until the summer of 2018, the club has exercised a clause that the striker wanted to have in his contract, whereby either party could terminate early in the event of relegation. Raith had been in talks to retain Craig Barr but the defender put out a statement on social media yesterday (Wednesday) confirming his departure. It read: “Thanks to Raith Rovers for a ... turbulent ... three years. Will always be grateful for the way they looked after me. They went above and beyond what was expected. “Forty four games in three seasons is not a stat I’m proud of, but I gave my best and full commitment in each of those 44 games. Rovers are still in discussion with youngsters Andreas Thorsen and Yaw Osei, while the future of Jason Thomson, the club captain for the past five seasons, remains in doubt with no contract yet agreed. Confirmed as staying at Raith are experienced players Kevin Cuthbert and Scott Robertson, who will both take on the role of player-coaches, along with Craig Easton, in a new-look backroom team for next season. Also retained are Kyle Benedictus, Bobby Barr, Ross Callachan, Ross Matthews, Iain Davidson, Lewis Vaughan, David McKay and Jonny Court. Rovers are scheduled to return to pre-season training on June 22 with the first competitive fixtures startng on July 15 with the Betfred Cup. A pre-season challenge match against local rivals Dunfermline has been scheduled for Monday, July 10, 7.45 p.m. The club has also announced that the Scottish FA has chosen Stark’s Park to host the Scotland Women’s national team’s final preparation match prior to this summer’s Euro 2017 tournament. Scotland will face the Republic of Ireland on Friday, July 7, with a 7.30 p.m kick off.